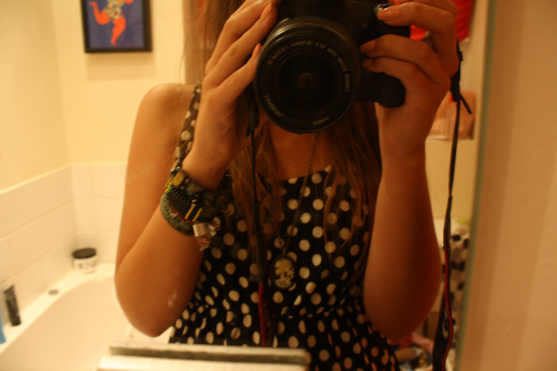 Obligatory "ZOMG I GOTZ A NEW CAMERAA!" photograph! My new Canon 1000D came today, So much hassle to get it (never ever going to use eBay again!!) but I adore it! I paid £265 for it, It was totally worth it! I'm thinking of it as an investment in this blog. Its something I'm so passionate about and something I really want to pursue and keep moving on up and up and making LLYMLRS better and better. Plus I want to make it more enjoyable for you guys, a new camera means more pictures, more inspiration, more stuff about my life! I saved up for it with my own money, I know people seem to think I'm super rich and can afford to drop money this on the spur of the moment, but I didn't! I love the quality and I cant wait to really get experimenting with photography again! I took some outfit pictures with it today, and they came out great quality, but I hate flash photography so I'll re do them tomorrow! I might change the way I take my photos, I'm considering doing full body shots as people have started moaning that I don't do them. I like my style though, I never wear anything below the knee of interest anyway! Who know it might change it might stay how it is! And for everyone asking I'm not selling my old camera as it was my Stepdads and he wants it back! and PS. Sorry for being such a bad blogger this week, I normally post everyday but things have been a little slow on the blog front as my routine has been changing, me and Ivor are also having a few relationship troubles which has been bringing me down! Oh well, I'm sure we'll be fine! I've got the weekend off for the first time in what feels like a 100 years! Tomorrow I've planned to sleep in, have a massive gym session and then go for a walk! In Greece we say 'me gia' when someone has something new.It means enjoy it/have fun. I really need a new camera, want a slr so bad. aww i hope you and your boy will be okay. i feel like going on a bit of a nice scenic walk too, plus a lovely weekend breakfast haha nummmm. Have a great weekend off, you can have lots and lots of fun with your new camera which will also help to take your mind of any boy troubles you've had - which I hope sort themselves out asap! Oh an snap, we have the same necklace, it's gorgeous isn't it? My friend want Canon 1000D too and I want Nikon D3000 both cams are very good! I just got a Canon Rebel EOS xs.....I am OBSESSED with it!! Hello, I want to buy a good machine, I need tips. His shifts the lens? Hey lady, here's that post with the portrait (draft) of you.